The fall is prime college application time for high school seniors. These days, the average student applies to at least nine colleges, and if you haven’t already started looking at potential schools for next fall, now’s the time–and why not start with PUC! Our online application is free and takes about 10 minutes to complete. We’ve created a handy high school senior checklist to help you stay on track all year long. On it, you will find a breakdown of what you can be working on each month. Hopefully it will help you get things taken care of! So, what else can you be working on? Plenty! Here’s just a few things to get you started; download the checklist for a complete inventory on what you need to do to be ready for college next fall. There’s no better way to see if a college is right for you than by visiting! We would love for you to join us on our campus. Take a tour with a student ambassador, meet with a professor in the major of your interest, and pick up some great financial tips. PUC accepts both the ACT and SAT. While they aren’t required for admission (except for admission on academic probation), tour test scores will be used for placement into math and English classes, and also for certain scholarship qualifications. It’s a good idea to take the test several times, rather than just once, particularly if your score is close to the qualifications for a scholarship. Starting October 1, 2017, you can fill out the Free Application for Federal Student Aid (FAFSA) at fafsa.gov. Submit your FAFSA as soon as possible since some aid is awarded on a first-come, first-served basis. Remember to include PUC’s school code (001258) to have your results sent to PUC, as well as to list at least one in-state college, otherwise you may be ineligible to apply for Cal Grant. Visit puc.edu/enrollmentforms to download your copy of PUC’s high school senior checklist today! If you have any questions about applying to PUC, contact the Enrollment Services office at enroll@puc.edu or (800) 862-7080, option 2. We’re here to help throughout the entire admission process, and we can’t wait to have you on campus next fall! Help Save the PUC Forest and Have a Delicious Snack Too! PUC is on a quest to permanently protect, preserve, and manage over 850 acres of the college’s forestland by purchasing a conservation easement. 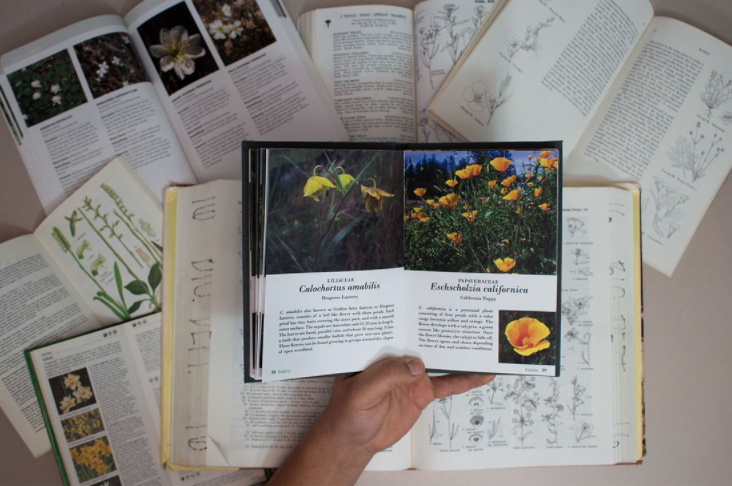 The PUC Forest Fund was created to help raise money for the easement, and faculty, staff, students, and alumni have rallied around this effort. Enter black(40)berry jam, a business endeavor started by PUC professor Chantel Blackburn and librarian Katharine Van Arsdale, along with professor Maria Rankin-Brown, and Judy Ness, a counselor at the college’s career & counseling center. 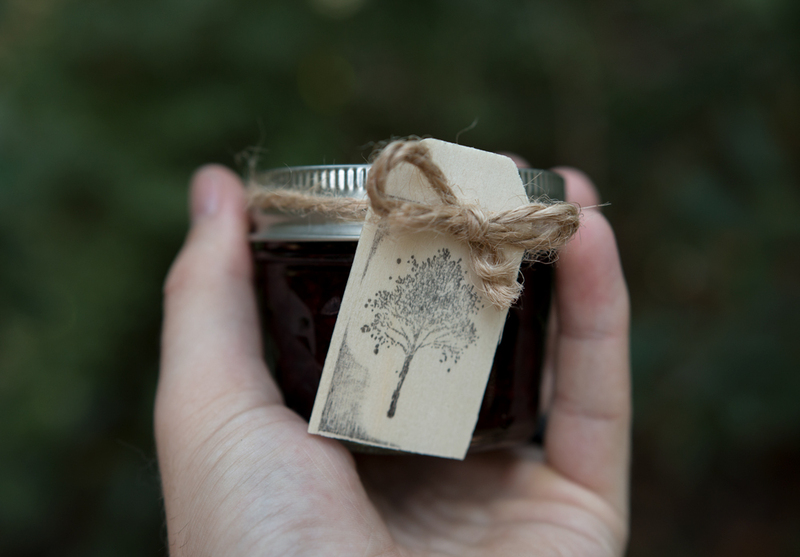 The goal of black(40)berry jam is to help raise money for the PUC Forest Fund. We asked Dr. Blackburn to answer a few questions about the business, and why PUC’s property is worth preserving. Where did the idea to sell jam come from? I grew up picking blackberries in the summer and making blackberry pies. As I was picking blackberries on campus this summer for my first pie of the season, I realized there were going to be quite a few available to pick as they continued to ripen. I had done fundraisers in high school selling apple pies and that was a lot of work, but freezer jam seemed like an easier way to appeal to folks who might be interested in supporting a fundraising effort for the PUC forest. I didn’t feel like I could do it on my own but ran the idea past a friend, who suggested I contact two back 40 supporters, Maria Rankin-Brown and Judy Ness, who might be able to help me get things up and running. They’ve helped support the effort financially, with berries, and with the inspiration for the name! I still needed help making the jam so I contacted Katy Van Arsdale, who graciously agreed to help transform the berries into jam and fill the jars! 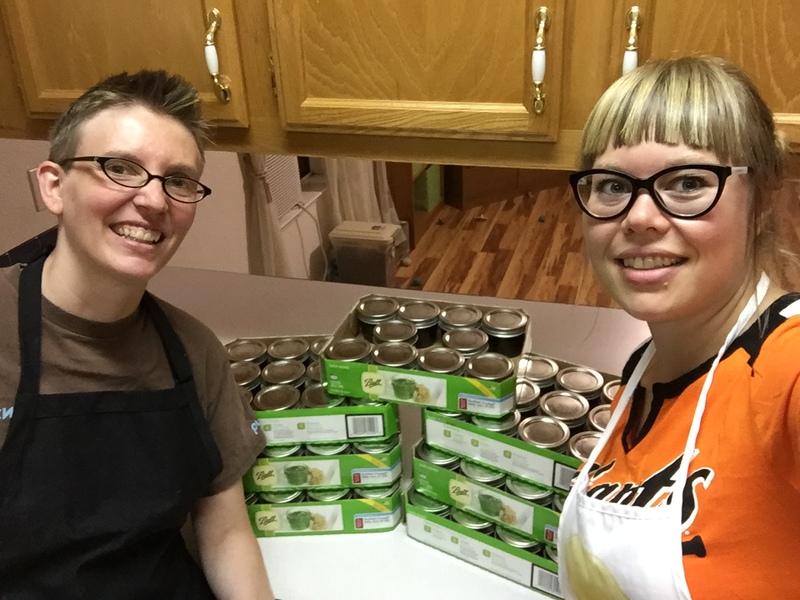 Chantel Blackburn and Katy Van Arsdale making black(40)berry jam. Where in the back 40 are you picking the blackberries? We’ve been picking blackberries mainly around the apartments and the airport. Maria also contributed about around a gallon of berries from bushes near her home, also on PUC property. How long does it take for you to make the jam? I think the most time-consuming part of making jam is picking and washing the berries. Picking about 14 cups typically took me about two hours and washing them (first in a solution of white vinegar and water then rinsed and dried) took at least another hour. We’ve picked between six and seven gallons of berries. Once that was done, Katy and I spent about 1.5 hours making our “first-run” of 36 jars (4 oz each) of jam. Now we know how the process works, it shouldn’t take us long to make the rest. We have enough berries, sugar, and pectin to make at least 120 jars total. Why did you choose to donate the profits to the PUC Forest Fund? Growing up in the Pacific Northwest, my paternal grandparents were always caring for their trees; I remember visiting during the summer in Oregon and playing with my brother and cousins for hours in the large wooded area behind their house and later exploring their 21-acre dream retirement property in Washington where they maintained their own forest and trails. I think their love of the forest modeled for me how important it is to be a steward of the land, and forests in particular, so supporting the PUC Forest Fund was a cause that really resonated with me. Supporting the PUC Forest Fund is really intimidating due to the amount of money that needs to be raised for the conservation easement. 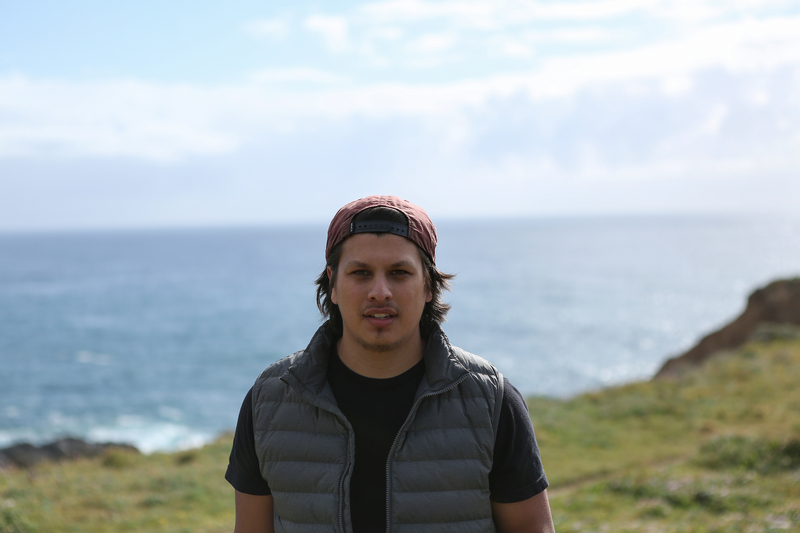 I wanted to create an opportunity for people to feel like they could contribute even a small amount and still make a difference–and together I think we can! We’re using wild blackberries growing right here on PUC land to make our black(40)berry freezer jam. It seemed like creating a special product that was made from this natural PUC resource and could be shared with others was a perfect way to support the college’s forest conservation efforts. What do you appreciate the most about PUC’s forest land? For me, the PUC forest has provided a number of opportunities for me to build community and fellowship with friends while hiking the trails on Sabbath afternoons. Now that I’ve moved to a home in Veteran Heights, I appreciate the forest is basically my backyard! How can someone buy a jar of jam? We’re asking for a minimum cash donation of $4 for each 4 oz jar of black(40)berry jam and giving 100% to the PUC Forest Fund. I’ve been taking reservations for jam on Facebook (e.g. Angwinville) or by email (cblackburn@puc.edu) and making arrangements to get it picked up–ideally at the College Market when I am there. I’m planning to have a table set up at the College Market on Fridays (12:30 p.m. to 3:30 p.m.) and Sundays (11:00 a.m. to 2:00 p.m.) until the end of August or the jam is gone, whichever comes first. If the jam isn’t gone by the end of August I’ll probably look at bringing it out again as the winter holiday season approaches. 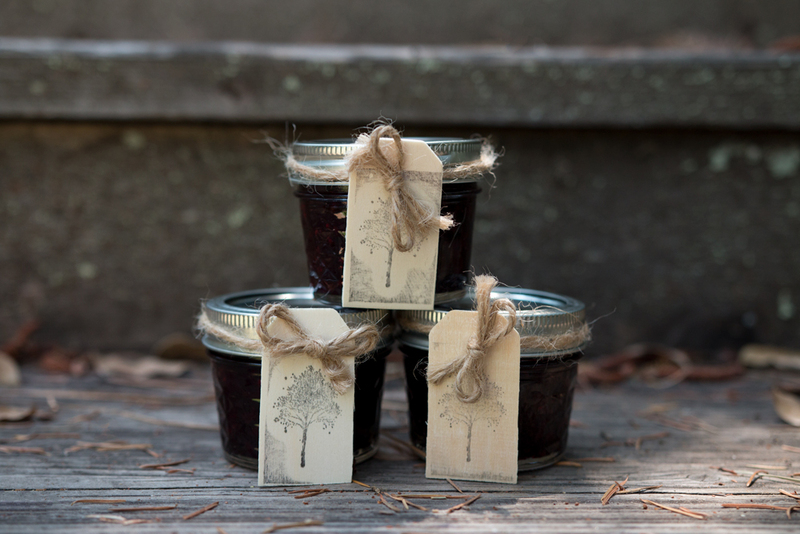 Want to support the PUC Forest Fund but can’t make it to Angwin to get your own jar of black(40)berry jam? You can still donate at puc.edu/give. Editor’s note: For more information about the PUC Forest Fund and the college’s progress towards purchasing the conservation easement, visit pucforest.org. How much does it cost to make a jar of jam? The cost for making one jar of jam, including the sugar, pectin, tag, and jar is around $1 but most of the expense is for the jar. How did you fund the production of your first 100+ jars? In order to ensure 100% of the proceeds could go to the PUC Forest Fund, a small group of us split the cost of producing the first 100+ jars. We looked at it like an investment; $10 invested in production costs was expected to bring in at least $40 in sales that go directly to the fund. How did your first full weekend (August 4 and 6) of sales go? We completely sold out! I was just floored by the overwhelming response to our effort. 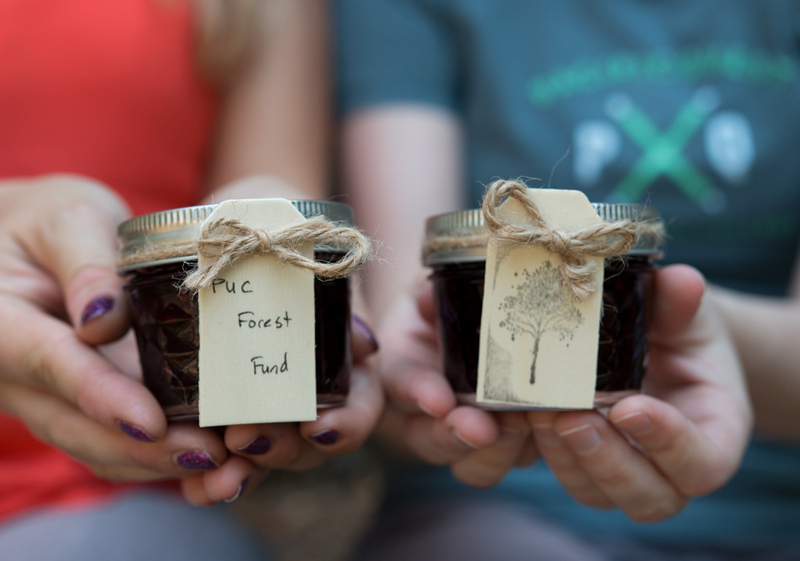 We sold all 118 jars of black(40)berry and raised over $550 for the PUC Forest Fund. That’s much more than our minimum projection. We are so grateful for everyone who supported the college’s conservation effort by making donations and taking home some jam. It’s fantastic that you sold out but does that mean you’re done with the fundraiser? I know I said we would be done if we ran out of jam before the end of the month but due to the overwhelming response on our first full weekend out, we have decided to make another 100+ jars of black(40)berry jam so we can continue raising money for the PUC Forest Fund during the month of August. We probably can’t make much more than that because the availability of berries is beginning to dwindle, and so is our time before the school year starts; I for one need to start focusing on preparing for fall classes! Will you be using previous funds raised to produce these new jars of jam? Absolutely not—we are committed to contributing 100% of the proceeds to the PUC Forest Fund. However, we are hoping there might be a few people who would be willing to invest, like we did, in making the next 100+ jars of black(40)berry. In particular, we are hoping to raise $100 to help defray to cost of additional production. This $100 doesn’t directly go to the PUC Forest Fund but it makes it possible for us to raise at least four times that much in jam sales that will. If you don’t care for jam, or maybe you’re not local and wanted a way to contribute, I hope you will consider investing a few dollars in the production of our black(40)berry wild blackberry freezer jam. If you’re interested, please email me at cblackburn@puc.edu. Many thanks to everyone in the community and beyond who joined us in this effort to preserve our forest! There is a recycling receptacle just outside the main entrance for the College Market where used black(40)berry jars (empty & rinsed) can be left. We’ve had 4 jars returned so far for reuse/recycling and hoping for more! Editor’s note: For more information about the PUC Forest Fund and the college’s progress towards purchasing the conservation easement, visit pucforest.org. If you feel compelled to donate, visit puc.edu/give.